I knew when I was a little kid, I had so much passion on arts and that's how I expressed my emotions and turn it into so many things. I made a barbie doll house from a shoe boxes and my bedroom wallpaper from potatoes collage! I think it's really fun and there are no barriers. You can make anything and express out your feelings onto a canvas or whatever medium. I realized my daughter get plenty of exposure to pop-cultures arts for her age range: "Dora the Explorer", "Gwiyomi", pop music, movies, and the like. Yet, my old school inner-say that my child also need to learn about and appreciate fine arts, like visual art at museums, theater, and more. She also need an outlet for her own creativity with opportunity to make art, like arts and crafts, painting and drawing, just like what I did when I was younger. 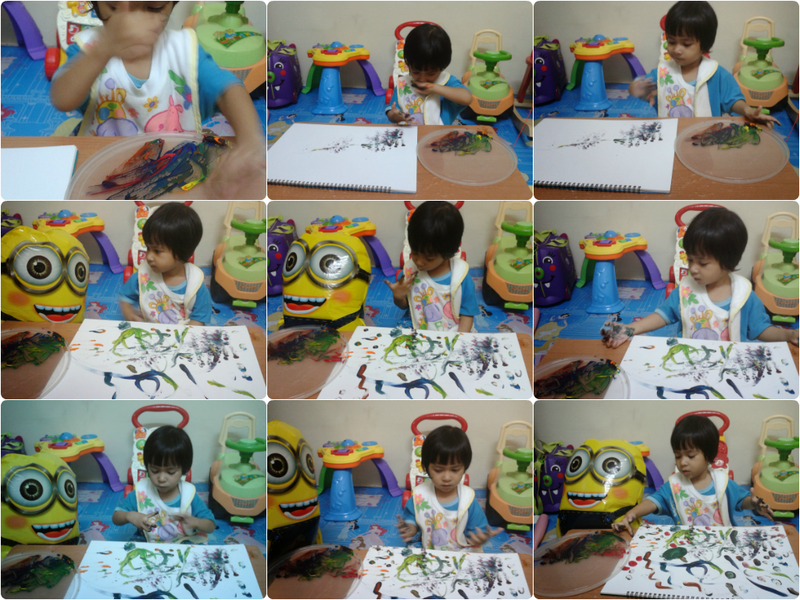 I bought a set of washable fingerpaints watercolor and a set of drawing block from Toys R'us for Aulia' last month. I got it all on special price for stars membership club card. When we get back home, I introduced her with red, yellow, blue and green colors. She was so excited and had a blast playing with the colors. One color ended up being mixed with another colors, and she painted worms, flowers, eyes..basically and endless source of fun if you're creative enough to think of it. It pretty funny I can say. I truly hope she never lose that creativity and imagination, and just plain joy in the simplest things that many would take for granted. It's wonderful to watch her mind works.